Here is the first one – kicking off with something easy and simple! I wanted to create a cute little mobile for our baby for his cot. I thought it would be a nice and easy project with maximum opportunity to sit down and rest my weary and pregnant legs. I really enjoyed this project as it was easy and I could pick it up and do a bit at a time whenever I needed a moment to rest. This cute mobile ended up costing less than a tenner too, another win in my books! We chose loosely a ‘camping theme’ for our son’s nursery and I thought these mountain/cloud/cactus motifs looked perfect! They also go with our main bedroom as we have set up his cot there for the first six months at least. I got the idea from this Pinterest post. Start by printing and cutting out the downloadable pattern on A4 paper. Grab your felt and add 0.5cm for seams. If you have sharp scissors you can cut through two at a time, but you should end up as many separate pieces as what is written on the pattern for each motif. Of course you can switch this up or even make different motifs if you like. Once you have your pieces then you need to embroider them. I used running stitch on all the smaller ones and one big one and split stitch for the other two big ones to make white “needles”. 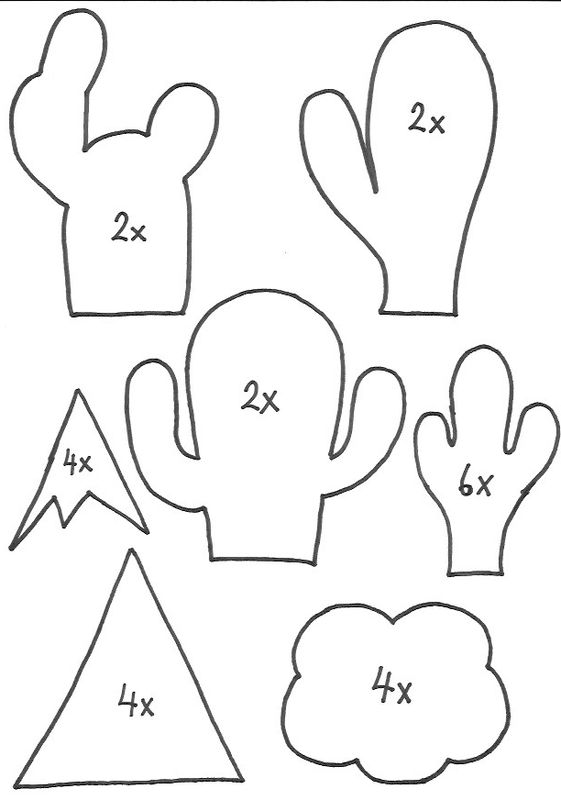 Don’t forget to do the back of the cactus as a mirror image – once you put them together you have two right sides up. If you are not familiar with these embroidery stitches then check out my previous post ‘making a monogrammed purse’ where there is instructions. It’s super easy hence why I use it quite often in my crafts! Once all the cactae are embroided I added the flowers on the big cactae. I cut them out of white felt freehand or you could draw one first with a pen that disappears. I then embroided them on with a yellow thread. I decided to sew the motifs together on the top part with sewing machine to avoid having to try to turn the motifs inside out as felt isn’t the most flexible and the figures are so small. Just go as close as you can on edges leaving some excess so they don’t rip. Start with sewing the white felt mountain tops onto the grey mountains. You only need to do the bottom of the white mountain top as the sides you can do together when you are putting the entire mountain together. My machine handled four felt pieces surprisingly easily. Just leave the bottom of the mountain open for stuffing. You can then sew all cactae and clouds too leaving the bottom open for each. When sewing the cactae with flowers just lift the flower to get closer to the edge. Next up is deciding how long you want your mobile to be so you can plan the spacing of the motifs on the string. Mobiles are meant to be for visual only and baby should not be able to grab or pull them. Also they need to be removed from the cot when baby starts being able to sit up and lift themselves up so bear this in mind when planning the lengths to ensure your mobile is safe for the little one. Once you are happy with your spacing then use strong and long string in a needle to poke through the top of the bottom motif e.g. mountain. I did a small stitch to ensure the motif is more secure on the string. I also doubled up my string to make it even stronger. Then leave your desired space for the next motif and repeat the process. Ensure you have loads of excess at the top of the top motif. Once you have strung all your motifs to five strings you need to stuff them with toy stuffing. I also found using the blade of the scissor or a pencil helpful pushing the stuffing through to tight spots. Once you are happy with the stuffing and shape of your motifs use the sewing machine to sew the motifs closed. Just remember to ensure the string is in the middle of the motif when going over it. I used the inner ring of an embroidery hoop with a circumference of 53cm to hang all the strings. You can either tie the strings onto the hoop, but I went the extra mile and dug out my Dremel to make five small holes of the hoop where I can tie the strings through. As the hoop had a circumference of 53cm I made the holes equal distance apart, which in this case was 10.6cm. I then used a little sandpaper to make the holes neater afterwards. Mobiles can be used from birth up until baby is able to sit up unaided or push up on hands and knees. Once baby can do this you need to remove the mobile. You always need to ensure the mobile is out of baby’s reach to avoid entanglement, it is only meant to be for visual stimulation and not intended to be grasped by a child. Ensure the mobile is hung securely at all times. I have only included these as just pointers, please research mobile safety for babies before hanging your mobile. P.s. If you want to see a some items we have chosen for the nursery decoration before I get a chance to do a blog post then head over to my Pinterest board!